Crown Reef Beach Resort, opened its first tower in 1994. 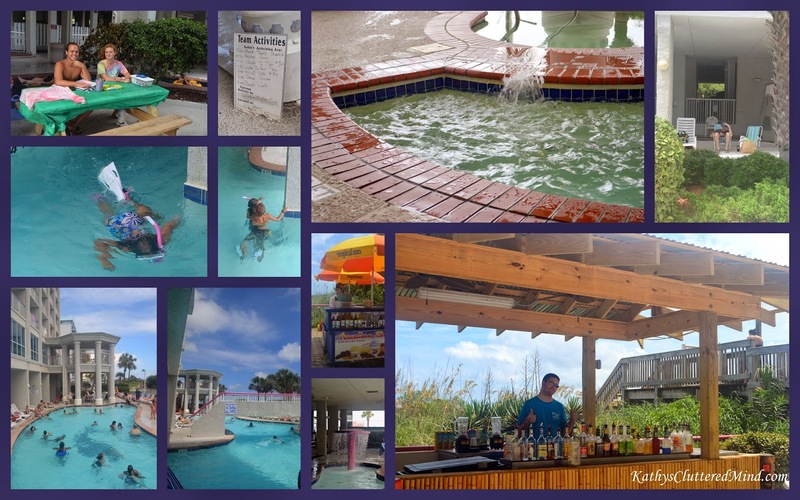 This affordable, family friendly, ocean front resort is located at 2913 South Ocean Boulevard along the south end of Myrtle Beach. It is just minutes from the Myrtle Beach airport and about a 1/2 hour away from a variety of attractions and entertainment, such as Alligator Adventure, Ripley's Believe It Or Not Odditorium, Myrtle Beach Boardwalk and more. 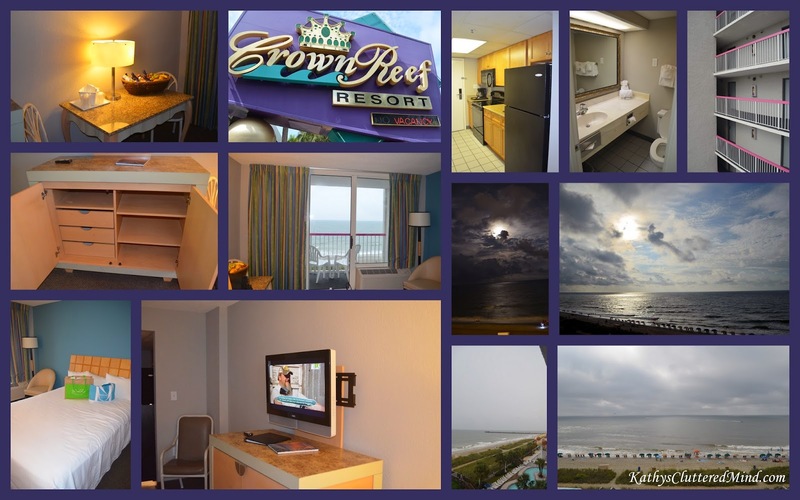 The Crown Reef offers the most oceanfront rooms (514) in Myrtle Beach, a large conference center, indoor and outdoor water amenities, on-site dining and more. In today's economy family vacations can be difficult to arrange. They are often cost prohibitive, unaccommodating, and require excessive travelling. But what if I told you there was an affordable, family friendly resort on the east coast that offers something for everyone in your family and is only hours away from major east coast cities? Yes such a place exists and it is called Crown Reef Beach Resort. Myrtle Beach is just 6 hours from Atlanta and a super easy, relaxing drive. Believe it or not we have never stayed at a resort so we were very excited and didn't know what to expect. The Crown Reef Resort has undergone major renovations over the last year totaling 7.5 million dollars. Some of these renovations include 500 newly renovated rooms, 2 million dollar Oceanfront Watepark, Loco Gecko Beach Shak Restaurant, Grab n’ Go Grill and Coffee Bar, Swirl Ice Cream and Sweet Shop, and Game On! More renovations are in the works and will continue to be added over the next several months. Finding the hotel was really easy...it's kind of hard to miss three giant towers. We arrived at the resort around 5 pm. Because of our blogger status we had priority check in at Tower 2, but standard check in is located across the street. The very friendly guest services hostess gave us our room keys, parking tag, bracelets for waterpark admission, hotel map, VMB card offer sheet and resort activity schedule. The check in was super quick and easy. After we got checked in we found a parking spot in the covered garage closer to our elevator and unloaded our luggage. There were ample luggage carts available by the elevators to make unloading and loading easy. There are plenty of elevators available so you don't need to worry about loitering around the elevators for too long. Below is a breakdown of all the fabulous resort features. We were in complete awe when we entered our room. It was large, clean and smelled great. But I will admit that we didn't even pay much attention to the room details when we walked in, because we all made a mad dash for the private balcony to check out our view first. We took advantage of the balcony several times during our stay. Each morning my husband and I enjoyed a quiet breakfast on the balcony while the children ate theirs and watched cartoons. And each evening we would sit on the balcony in the moonlight and listen to the waves crashing on the beach. After soaking in the beach front view, which all 514 rooms at the Crown Reef offer, we then preceded to check out our room and unpack. The updated decor is bright and modern, but still retains a beachy feel and look with light oak furniture and a blue and white color palette. We stayed in an Oceanfront Queen Efficiency which sleeps 4 (2 double beds). The room has many amazing features and Crown Reef definitely tries to make you feel at home as much as possible. When you first enter the room you will be standing in the full kitchen area complete with a full size refrigerator, sink, granite counter tops, a microwave, stove, coffee maker, serving dishes and utensils as well as granite counter tops! Having the kitchen was amazing. About 10 miles away from the hotel we stopped at one of the many local grocery stores to pick up beverage, breakfast, lunch, and snack items. It was terrific not having to eat out for every single meal and it really saved us lots of money. Other features included a dining table for 2, 2 chairs, a nightstand, a dresser, ironing board and iron, closet with hangers, in room safe, flat screen TV and hair dryer. The beds were really comfortable and included ample pillows. There are also basic rooms, deluxe suites and jacuzzi suites available. We had the opportunity to meet our housekeeper a few times during our stay. She was very kind and provide us with everything we needed on a daily basis to make our stay as comfortable as possible. As we were leaving our room on the last day she was in the hallway. She thanked us for visiting, told us to visit again and wished us safe travels home. How often does that happen at a hotel or resort? The Crown Reef Resort just opened a new 2 million dollar Oceanfront Waterpark. This amazing waterpark is free to use for all Crown Reef Resort guests. Remember I mentioned something for everyone. 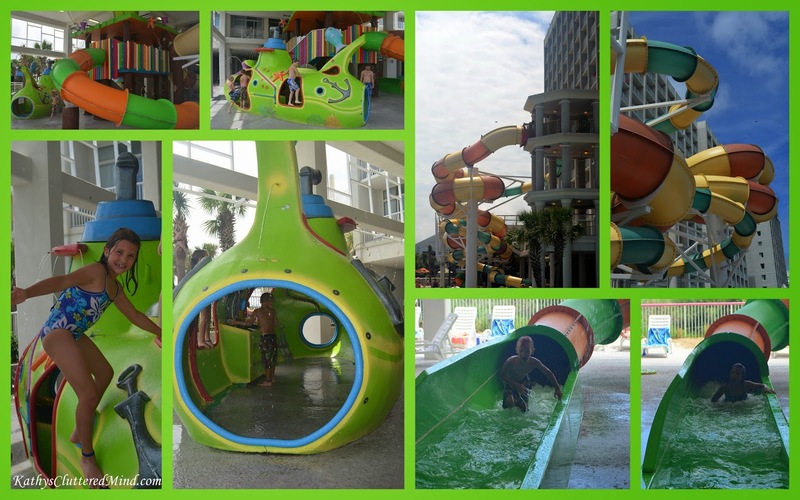 For family members who are not fond of the sand and ocean they will really enjoy this waterpark. We didn't hit up the waterpark on our first night, but we did take full advantage of it our second and third. The new waterpark towers 40 feet above the ground and features a 278-foot long two-person tube waterslide, a single-person 302-foot long waterslide and an 8-foot tall, 20-foot long slide for the little ones. The "TWISTER" Waterslide and the world's first hotel" EXPLOSION" Tube Waterslide are the two newest water amenities at the Crown Reef. The two-person “EXPLOSION” tube slide pumps more than 2,500 gallons of water per minute. The "EXPLOSION" is a two-person serpentine-style ride with many left-to-right turns in 54-inch enclosed flumes. There are tight radius, 360-degree turns where the fiberglass enlarges and explodes into a 72-inch diameter to provide a change of speed and direction and add an all-new experience to the ride. The “TWISTER” slide, is a one-person body slide that pumps 800 gallons of water per minute. The waterpark also includes a water fun area for all ages with a silly sub and other fun water features, like a giant dumping water bucket. My children are apprehensive of large slides so they mostly hung out in the water fun area and rode the 8-foot slide over and over again. But don't let this little slide fool you, it is really fast!! The lines were always short which was perfect for impatient children. There is ample seating in this area so parents can relax while children play. And guess what? This attraction will be open year-round! Yup even in the winter you can enjoy the waterpark, because it will be enclosed. 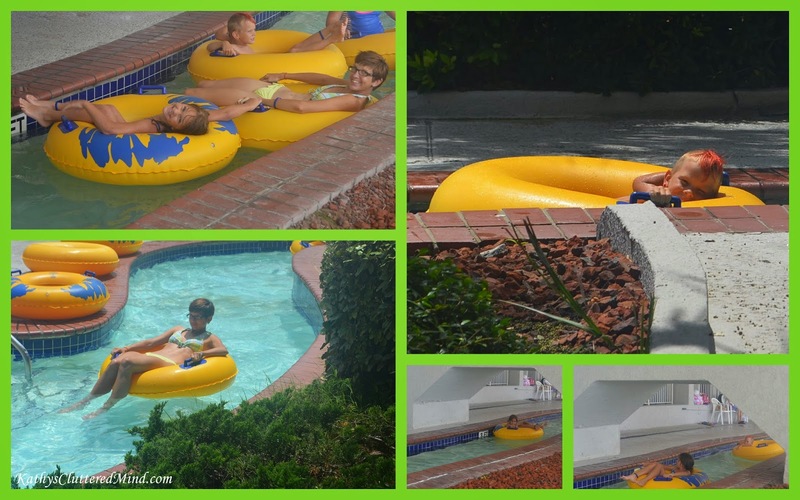 Besides the awesome waterpark and water fun area there are several other water features including a tropical island pool, heated indoor pool, hot tubs and fountains. Our family loved the 125-foot ocean front pool, which was never crowded. For the younger children who are not quite ready for the big pools there are three kiddie pools. On days it is really hot or raining you will love the large winding pool by Tower 1 where you can be splashing around in the sun on one side and protected with a covered top on the other side. The children loved the bridge with the sprinkler in this pool. And parents there are 11 hot tubs where you can relax. Yes moms you get to relax too on this vacation! I spent some time in the hot tub relaxing (with an adult beverage) while the children enjoyed the lazy river, it was perfect! The pool deck is always hopping but surprisingly it is never too crowded. We always found a lounge chair or table and there were plenty of areas that provided shade if you are not fond of baking in the sun. Here are some of the other things going on around the pool deck. Pool side bar where you can get yourself a refreshing beverage. I made friends with the amazing bar tender and bumped into him several times during our stay both on the resort and off. He even posed for a photo. Salty the Shark appearances. Salty visits the Crown Reef every day except Sunday in June and July. Chief Kamu's Fire and Hula show. Cheif Kamu is a native Hawaiian and shares stories about Hawaii and performs a captivating fire show. His authentic hula dancers also teach you how to Hula Dance if you are feeling brave. Greg Holt Magic Show. Greg performs weekly magic shows right at the pool, or in the arcade if the weather is bad. Other activities may include trivia extravaganza, water aerobics, tie dye shirts ($10), family scavenger hunt, hula hoop and limbo contests, arts and crafts (fee varies), beach soccer, beach kickball, Hair wraps ($1 per inch), shark tooth search, pool games and more! When you check in you will be provided with a list of events for the week! Need some alone time? Then take advantage of the Kids Night out for $15. *All activities are subject to weather and occupancy. Get super lazy on the Lazy River. This was were we spent the majority of our time. We floated round and round the 575-foot lazy river for hours each day. It is the longest oceanfront lazy river in Myrtle Beach. Tubes are provided and we could always find a tube when we needed one. I loved that I could relax in a hot tub or on a lounge chair and easily keep an eye on the children while they floated in the river. The Town Center opened this spring and offers visitors oceanfront dining and entertainment! 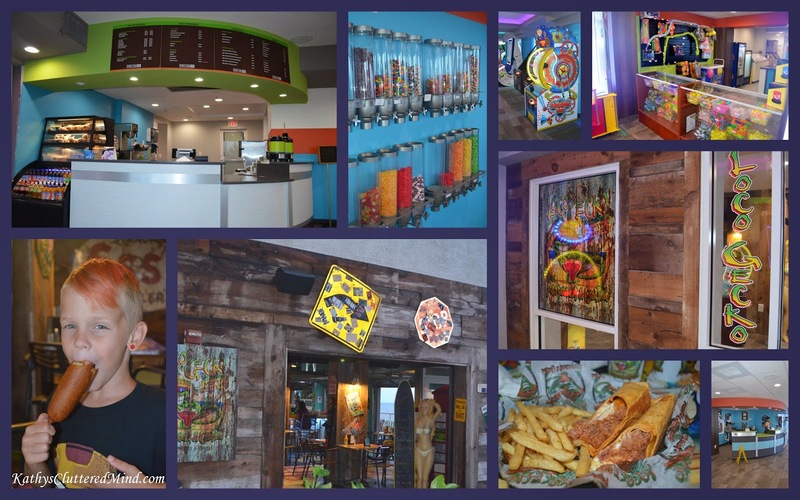 There is a casual dining restaurant, coffee bar, ice cream and sweets shop, and video game arcade and redemption center. Below is a breakdown of these areas. If you need something to keep your children busy for an hour or so you can head to Game On! This arcade center provides children a fun place indoors to relax and have fun! You can easily load a game card with credits for playing games, that way children can pick and choose which games they want to play without the hassle of coins or bills. Some of the games include Crank It, Sink It, Super Bikes 2, Typhoon, Ice Ball, air hockey, Doodle Jump and more. For even more added fun you can earn tickets/points by playing the games and then redeem them for small prizes at the Winner's Circle. Tickets/points are automatically added onto the card so there is no need to hassle with carrying paper tickets around. Whether you are looking for a light breakfast, quick lunch or dinner, refreshing beverage or a tasty snack the Grab N' Go Grill has something for every appetite. The thing I liked most about the Grab N' Go Grill was that everything was really affordable. There are plenty of indoor and outdoor seating options too if you choose to stay rather than go! Breakfast buffet options include a continental style breakfast with biscuits & gravy, pancakes, sausage, bacon, eggs, fresh fruit, pastries, and more. Tip: If you add the breakfast buffet to your reservation you can save money! Dinner, lunch and snack options include pizza, corn dog, salad, chicken wings, chicken fingers and more. There is a wide variety of cold and hot beverages to choose from including fresh-brewed coffee, smoothies and more. We definitely utilized the Grab N' Go during our stay. One evening we enjoyed a quick, quiet dinner there and the morning we left we stocked up on some bottle beverages and snacks for the road. If you are looking for a way to cool down after spending all day at the beach or waterpark in the sun then check out Swirl Ice Cream and Sweet Shop. Swirl Ice Cream shop serves up creamy Breyer's ice cream. Flavor selections include mint chocolate chip, french vanilla, cookie dough, strawberry and more. At the Sweet Shop you can find all kinds of sweet goodness to add to the top of your ice cream, from gummy bears to M & Ms, there is something for every sweet tooth. I don't know about your children, but mine love ice cream and sweets so this place was totally irresistible and added even more fun to our vacation. We are loco for the Gecko. We ate dinner at this brand new restaurant 2 nights during our 3 night stay. I loved that we didn't need to leave the resort to have a nice, relaxing sit down dinner. As long as there are not hurricane force winds the Gecko opens the garage doors on the restaurant to give you fabulous view of the Atlantic while you dine. The restaurant decor is everything you would expect from a beach shak resturant. There are fun beachy signs, and beach themed art pieces. The restaurant features casual beach dining and has variety of menu options including salads, pizzas, burgers and more. For children there are several tasty options on the children's menu. You can choose to sit inside or outside, but either way you will still get to experience the ocean breezes and beautiful view. We were able to feed our family of 4 for around $35 (including tip). The restaurant was never crowded and we often had our choice of seating. During each of our visits the waitresses were helpful and friendly. We had one minor issue during our 2nd dinner visit, but the attentive restaurant manager resolved the issue quickly and professionally. The children were thrilled that we were able to take our plastic Loco Gecko cups home as souvenirs! Don't worry I didn't forget about beach! After all the beach would be one of the main reasons you stay at an ocean front beach resort, right? We spent afternoons relaxing on the beach, swimming in the ocean, building sand castles and of course collecting shells. 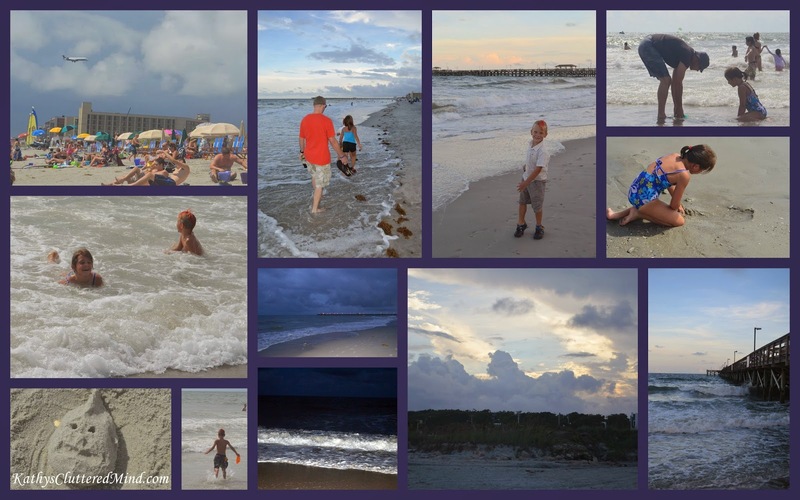 And each night after dinner we took a nice relaxing walk on the beach to collect more shells and do some beach combing. It is amazing what you can find laying on the beach after a busy day. We were even able to sneak in a beach geocache which we found several resorts north of the Crown Reef. And shh don't tell the children, but we also were able to sneak in some homeschool too! The beach is full of educational learning opportunities. Accessing the beach is super quick and easy. Just walk through the pool area, over a gated bridge and your toes will be touching the sand. If you don't want to lug your umbrella and chairs out to the beach you can rent a set of comfy chairs and an umbrella for the day from the lifeguards. There are numerous wash stations to rinse off sandy bodies and gear before heading back to your room or next amenity. A few other amenities I'd like to mention include the fitness center (which will be getting an overhaul too) and a 12,000 square foot space for meetings, banquets, weddings and events for groups of 25 to 1,200. So are you ready to book your next vacation now? The Crown Reef “all-in-one” resort offers something for family at an affordable price. You can stay at the resort the entire time and never run out of stuff to do or head to the many wonderful attractions located around Myrtle Beach. If you decide to take advantage of the local attractions be sure to check with the Crown Reef front desk to see how you can save and in many cases even purchase your tickets. 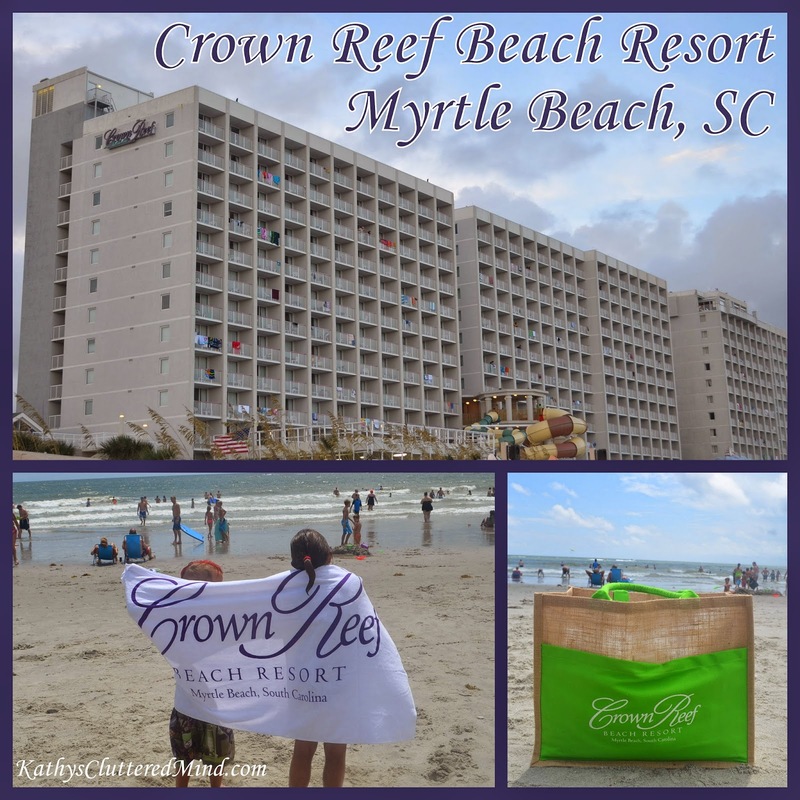 We would definitely stay at the Crown Reef Beach Resort again! For families looking for a great budget friendly option definitely check the Crown Reef Resort first. Rates start at just $39 a night on select dates. Crown Reef Resort offers a variety of special throughout the year. Check their Specials Page for more details. What do you think your favorite amenity would be? We were given 4 days, 3 nights at the Crown Reef Resort plus a $100 food voucher in exchange for our review, all opinions are our own.